Pas cal Poizat, is a former colleague and a friend of more than 20 years. Today he is retired and lives in Sallanches in Haute-Savoie (in the Alps/ mountains). He is a great athlete, sensitive to the handicap. He decided to join the Peloton of Hope and therefore the FA community without hesitation. He involved his friends in this race and convinced the International Mont Blanc Triathlon to also help FA Research for the next event, taking place from 25 to 27 August 2017. An area will be dedicated to communication as well as fund raising from the participants. I encourage you to visit their website http://montblanc-triathlon.fr/humanitaire/. If you are a sport, cycling enthusiast or if you know someone who likes sport, I encourage you to participate to the International Mont Blanc triathlon. “It was without hesitation that I responded favorably to Anabella when she spoke to me last September about the Peloton of Hope. Having always loved to travel in wide spaces, ecological and soft means of transport like bike riding have always had my preference. 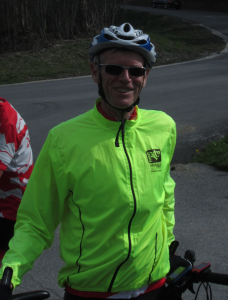 Member of the cycling club of Sallanches, and the triathlon club of Passy, I have widespread the event “the Peloton of Hope” over my friends, my village… Bernard Fermeaux member of the cycling club Sallanches will accompany me to share the life, difficulties and joys of all cyclists from Strasbourg to Lentilly. A few cyclists from Haute-Savoie and cycling friends from Lyon told me that they intend to come to Lentilly to the single day-event too. Participating in the organization of the International triathlon of Mont-Blanc and especially in charge of registration, I got the agreement of the organizing committee to communicate and raise funds for the FA. So I’m going to propose to all the triathletes registering for our event to have the possibility to donate from 1 to 20 € for research on Friedriech Ataxia. A communication space will be reserved next to the Lake of Passy on 26 and 27 August, days of the event. I have always had a deep respect for people that suffer in their lifes for many reasons like handicap and a great admiration for those who struggle by practicing the sport they prefer. It is with great pleasure that I will participate in the Peloton of Hope with disabled and not disabled cyclists and from different geographical regions.